Michael Vignera was a three-time loser in the summer of 1961 when he was convicted of armed Robbery. A multiple felony offender, his sentence was substantial: 30-60 years in prison. Vignera had robbed Harry Adelman at knifepoint at Adelman's dress store ("Chapeux de Mode") on 13th Avenue in Brooklyn. Eventually, both AD1 and the Court of Appeals affirmed Vignera's conviction. But soon thereafter, the Court of Appeals would amend its remittitur, indicating that, in affirming, it had necessarily passed on two constitutional questions, They had to do with whether or not a Kings County ADA who took a stenographically recorded statement from Vignera prior to his arraignment had done so in violation of Vignera's rights under the 14th Amendment. Vignera had been arrested in Manhattan (someone had been caught using Adelman's Diners Club card and told detectives where he got it from—Vignera.) Vignera confessed to the detectives and was ID'd by Adelman and a saleslady. He was then taken to the 70th Precinct in Brooklyn, where the ADA questioned him about the crime. At trial, the transcript of that interview was read to the jury. Which one of Vignera's constitutional rights had been violated? His 6th Amendment right to counsel, flowing through to the states via the 14th Am. But Vignera was a chatterbox; he should have kept his mouth shut; who's to blame for that? So what if he didn't know any better? But wasn't he entitled to the counsel of someone who did? A lawyer? In America, didn't he have the right to counsel and even to be told he had that right, in case he didn't know any better? As Vignera's attorney would argue, wasn't it time "an American 'folk ritual,' the extraction of confessions by the police, in camera and in the absence of counsel" stopped? Earl Warren agreed, writing for the majority that such questions "go to the roots of our concepts of American criminal jurisprudence[.]" The case has come to be known by the name of the lead petitioner of four in what became a consolidated decision, Ernesto Miranda of Arizona. On Law Day, however, the message is universal, whether you're a "Vignera" in Brooklyn, a "Miranda" in Phoenix, or a "Westover" in Kansas City: Without a lawyer by your side, the Constitution is just a promise. We've done many things in the law and, as you all have, we have picked up more arcane knowledge than a lint brush in a flannel factory. Why, for example, would anyone want to know about pre-1929 fire escapes in New York City? For those who read Justice Tom's exegesis on the subject last week in KIupchak v. First East Village Associates, 2016 NY Slip Op 03276 (1st Dep't, 4/28/16), the answer is clear. Plaintiff fell through an ancient, pre-1929, wrought iron vertical fire escape ladder attached to an old building on 2nd Avenue. She had climbed out a friend's apartment window to avoid the cigarette smoke within, get a breath of fresh air, and see the view of the City. It was dark and she knew the fire escape had an opening at the end leading to the level below. However, when she turned to return through the kitchen window, her heel caught in the slats of the platform and she fell through the opening, 12 feet to the platform below, a paraplegic. 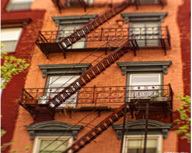 Statutes (MDL § 53 and HMC § 15) prohibit this type of fire escape in the City; but do they apply to pre-1929 fire escapes? Supreme Court held that the building was erected before the MDL was enacted (1929) and could therefore only be applied to fire escapes built after that. But, on reargument, it relented, holding that since 1948, no such fire escapes could exist anywhere in the City at all. AD1 agrees and Justice Tom threads the MDL with great aplomb, finding that in 1948, the Legislature amended § 53, requiring that every fire escape like the one that injured the plaintiff here was to be "removed and replaced," without exception. That section was also written in the future tense, suggesting that future action was intended. Even if that weren't so, the conversion of the old-law tenement into a Multiple Dwelling made it subject to all the MDL requirements, notwithstanding when it was built. AD1 affirms the grant of partial summary judgment. Ancient fire escapes; the right of sepulcher; the law of waxed floors; who takes from Prince's estate in intestacy. We are a wonder.